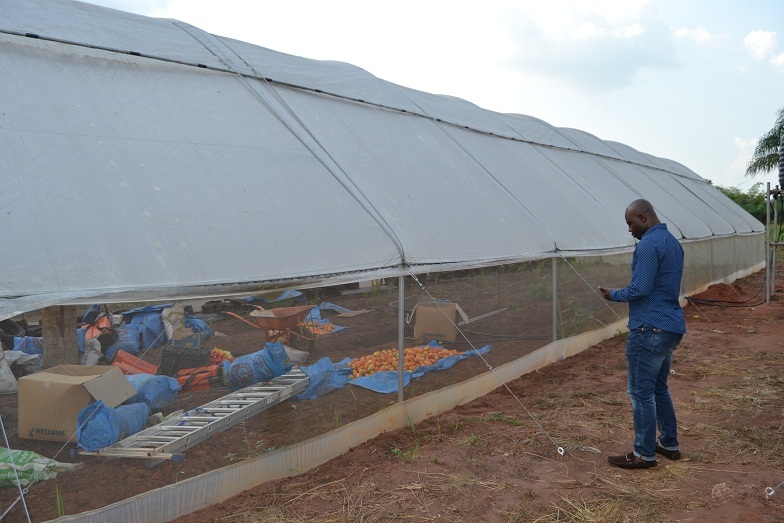 A Private Investor, 3D Hitec Systems, has teamed up with the Central Bank of Nigeria and its affiliated partners to suport Tomato farmers in Delta state and give them renewed hope for improved yields and bumper harvests, with the unveiling of 3D Hitech Systems Nigeria Limited, as the main off-taker for all harvested produce by registered Tomato farmers in the state under the Private Anchor Borrowers scheme of the Central Bank of Nigeria, CBN. 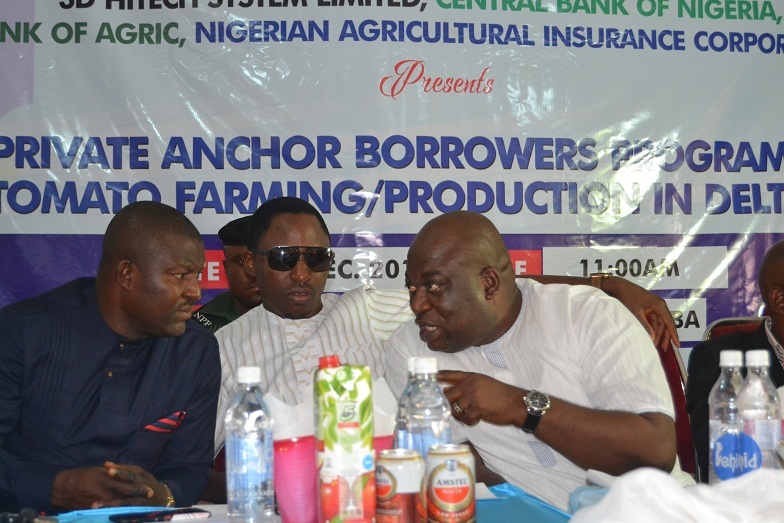 This disclosure was made on Tuesday, December 6, 2016 in Asaba, during the presentation of the Private Anchor borrowers programme on tomato farming and production by the tripartite sponsors, Central Bank of Nigeria, CBN, Nigeria Bank of Agriculture and the Nigeria Agricultural Insurance Corporation, NAIC, and the introduction of the principal off-taker of the scheme in Delta state, 3D Hitech Systems Nigeria Limited. Addressing participants and newsmen at the presentation ceremony, the Managing Director, 3D Hitech Systems and proprietor of 3D Farms, Mr. Patrick Azi said that he was inspired to embark on tomato farming to prove that the soil in Delta state and Nigeria was fertile for tomato farming, adding that he was further motivated by the pragmatic policies of the Delta state government to encourage private investors, who were keen to invest in Agriculture in the state. Mr. Azi who affirmed that his vast farm and processing facility, situated in Iselle-uku, Aniocha North LGA in Delta state, was presently producing over 500 kilogrammes of Tomatoes, with the potential of increasing production in the coming months, assured that he had more than enough capacity to accommodate all harvested tomato produce by registered farmers under the scheme, adding that he also enjoys critical support from his bankers, including Stanbic IBTC Bank, as well as the CBN, who has provided all the requisite support for Ease of business in the Private Anchors Borrowers scheme. 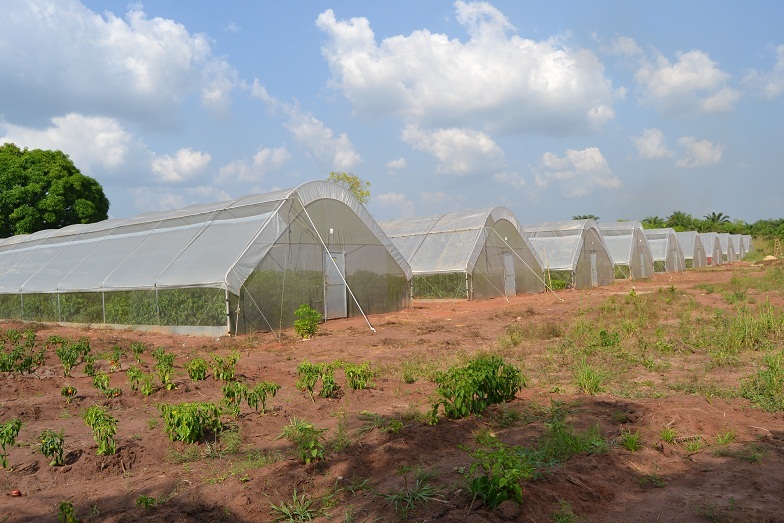 “We still have over 250 hectres of farm land yet to be developed and with a large tonnage of Tomatoes to supply to our international partners, Erisco Company, it is indeed a new dawn for tomato farming in Nigeria. 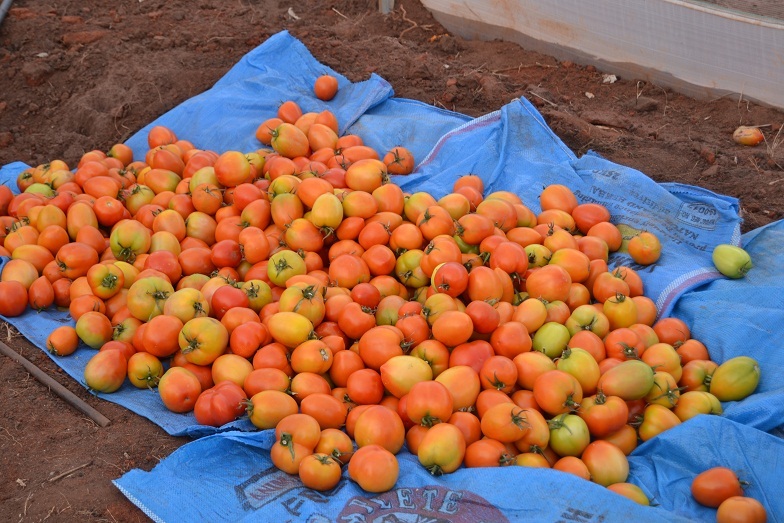 However Water supply and Power have remained major challenges but we are handling these challenges adequately and enjoin tomato farmers in the state to be steadfast and committed in order to reap the lucrative benefits of the scheme. 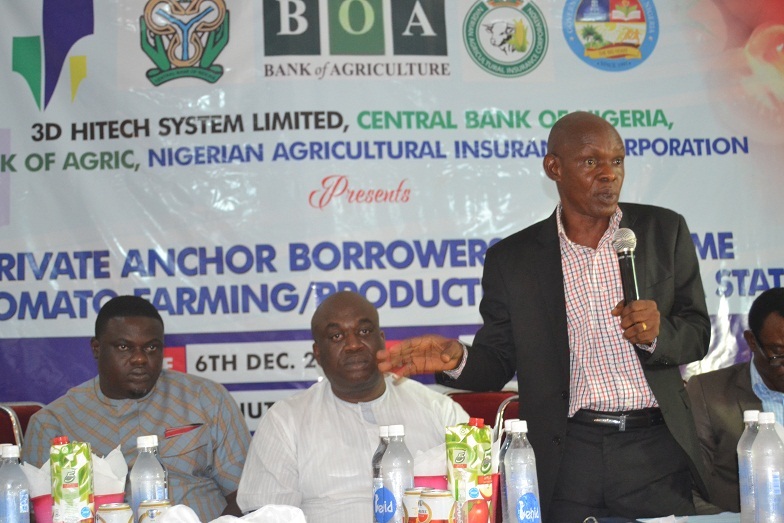 In their separate comments addresses to participants at the presentation ceremony, the CBN representatives Mr. Matthew Badaiki and Mr. Bukar Alli, Senior Manager Development Finance Office, Asaba, as well as Ambrose Nwabuzor of the Bank of Agriculture, Asaba office and Agbala Susan of the Nigeria Agricultural Insurance Corporation, all highlighted the need for private Tomato farmers to key into the scheme as registered Cooperatives, emphasizing that the Private Anchor Borrowers programme was initiated to solve the problems of Agricultural financing by providing loans as well as creating markets for buying and processing harvested produce. They were also quick to stress that the scheme was not meant for those they described as portfolio farmers and while cautioning farmers to identify with specific crops to access the loan facilities, in this case tomato, noted that the scheme has considerably reduced the incidences of loan diversions and lack of market, adding that they were impressed with the facilities and capacity of 3D Hitech Systems Nigeria Limited to make the programme a huge success in Delta state. Those who witnessed the presentation ceremony included Rt. Hon. Friday Osanebi, Deputy Speaker, Delta state House of Assembly, Hon. Festus Chukwuyem Okoh, representing Ika South Constituency in the Delta Assembly, Hon Ossai representing Ndokwa nation in DESOPADEC and Hon. Karo Ilolo, Delta state Commissioner for Urban Renewal, who represented Governor Ifeanyi Okowa and noted that the Private Anchor Borrowers scheme would create employment and generate income to the state, even as he enjoined farmers to key into programme with honesty and transparency.